Alejandro G Iñárritu directs Leonardo Dicaprio and Tom Hardy in the gruesome survival tale The Revenant based partly on Michael Punke’s novel by the same name. 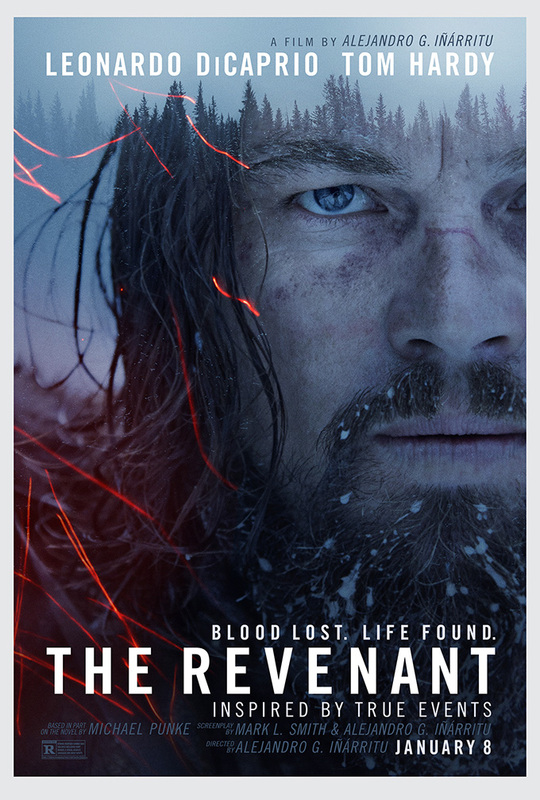 Set in the 1820s in Montana and South Dakota’s harsh winter wilderness it is the story of Dicaprio’s Hugh Glass as he leads an expedition of Fur trappers which is attacked by the Arikara tribe of Native Americans who are out to avenge a kidnapped tribeswoman. Leonardo Dicaprio plays Hugh Glass an experienced hunter with knowledge of the terrain, Tom Hardy plays hot-headed hunter John Fitzgerald, Domhall Gleeson plays captain Andrew Henry and Will Poulter plays Bridger one of the two young boys on the expedition the other being Glass’s Native American son Hawk. When the hunting party is attacked by Arikara tribesman they make a hasty retreat back to their boat with their fur pelts and escape downriver. This drives a wedge between Glass and Fitzgerald who both have different ideas on how to get to safety. The crew trust Glass especially since Captain Henry seems to trust Glass implicitly. Fitzgerald is a poisoned presence from the very beginning and his nagging and antagonising of Glass only increases after the crew abandon the boat and hide the fur pelts to travel light and come back with armed reinforcements. Fitzgerald however agrees to stay back with Bridger and Hawk to care for Glass after he is mauled by a Grizzly Bear. What follows after is a harrowing tale of how Fitzgerald’s greed compels him to kill Hawk, leave Glass for the dead and lie to Bridger about approaching Arikara tribe and beat a hasty retreat to the barrack outpost to collect the money promised to him by Captain Henry if they stayed and gave Glass a proper funeral. What follows is Glass’s incredible journey from being left for dead to returning to avenge his son’s death. Along the way he encounters obstacles that are impossible to even imagine and seeing how this is partly based on true events it just makes it even more astonishing. Emanuel Lubezki is gunning for a hat-trick after winning in 2013 for Gravity and in 2014 for Birdman and this year with Revenant his claim couldn’t be stronger. Gravity had that 7 ½ minute opening shot where not a word was uttered and you were given the full extent of the vastness of the space, Birdman had that continuous shot winding down the different nooks and crannies of a New York theatre and The Revenant has this stunning opening sequence of Glass and company being attacked by Arikara tribesmen it is as beautiful as it is brutal and unlike Gravity and Birdman there is fast and furious action here which while adrenaline charged still does not feel fuzzy or rushed, you can almost hear the whoosh of an arrow shooting past you. Lubezki has lit the entire movie with ambient light sources like campfire and candles and using natural lighting and the effect is eerie and haunting. He has shot the unforgiving landscape in a beautiful way, the breaking of the dawn has the full spectrum of colours as your eyes traverse the screen from left to right. Ryuichi Sakamoto who did the music for Iñárritu’s confounding Babel does the music for The Revenant along with Carsten Nicolai and they underscore Lubezki’s beautiful images with a poignant and restrained original score. At times angry and at times quiet and subtle. The only problem for me is the seemingly choppy editing at the outset where the movie stutters to a start but then the editing becomes more seamless as the story progresses. Iñárritu tries to reach for something more than what the story should be about. 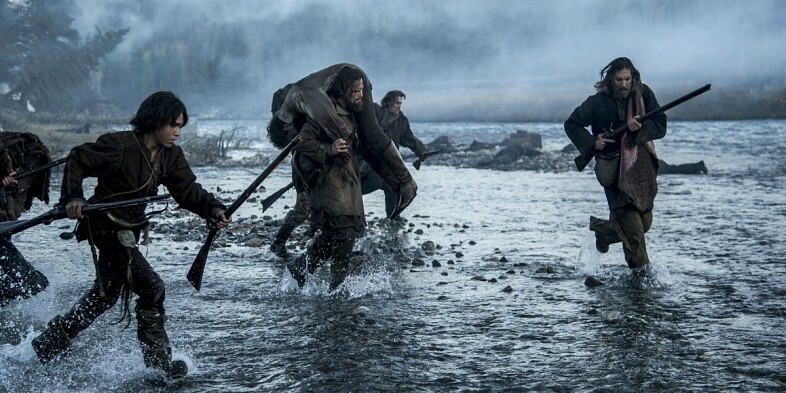 At its heart The Revenant is a western revenge epic but by tying in Native American elements Iñárritu tries to elevate the story and in some places he manages to by showing how the native inhabitants of North America were brutalised by British and French who tried to “civilise” them, but then at other places it just becomes a babbling mess with floating dead wives and a pyramid of cattle skulls. This is a movie that requires a certain amount of patience to sit through all the harrowing experiences Glass goes through and that is primarily a fault of the editing but there are plenty of rewards to be reaped as Lubezki reaches Deakins’ level of greatness with being able to capture the American wilderness and Dicaprio and Hardy put in terrific performances. Best of the year? Probably not I would take the other Hardy pic of one man’s epic survival against all odds in Mad Max Fury Road but this is still an incredible and important cinematic experience.